If you would like to read more about the history of nursing, particularly the military nursing services, the following list should give some ideas. Many of the books are available through libraries, second-hand bookshops across the country, and online. Most of the books relate specifically to the history of nursing in general, and the military nursing services in particular. I've included some memoirs and private accounts, but be warned that a few of these contain a lot of one-sided comment and inaccuracy - reader enjoy, but beware! Queen Alexandra's Royal Naval Nursing Service; Kathleen Harland; G. Shepherd (Portsmouth) Ltd.
Diary of a Nursing Sister on the Western Front 1914-1915; published anonymously by William Blackwood in 1915, but since attributed to Katherine Luard. Unknown Warriors; Kate (Evelyn) Luard; Chatto & Windus; 1930. A continuation of the book above, taken from letters and diaries. In All Those Lines; The diary of Sister Elsie Tranter 1916-1919: Edited by J. M. Gillings and J. Richards; Published by the Editors 2008. Edited diaries of a member of the Australian Army Nursing Service. A V.A.D. in France, Olive Dent; Grant Richards Ltd., 1917. 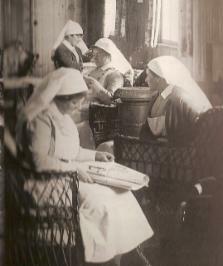 An account of Olive Dent's experiences as a nursing VAD at No.9 General Hospital in Rouen. We That Were Young; Irene Rathbone; Chatto and Windus, 1932: A novel, though strongly based on Irene Rathbones own experiences in France as both a YMCA canteen worker, and also as a nursing VAD.